Shiokoji is one of those wonder foods: versatile, easy to use, has tons of health benefits, and is yummy. Marinate meat, vegetables, fish in shiokoji for a few hours or overnight and cook, or just season fresh vegies like tomatoes or cabbage with it and you have a delicious salad with a rich salty flavour that is better than salt, as shiokoji is fermented and has all the enzymes that aid digestion and improve microbial ecology in your tummy. But most importantly, because it’s fermented, shiokoji adds “umami” , the all important mmmm taste in food. Koji is a type of fungus called Aspergillus oryzae and is used in making sake primarily, but also mirin, rice vinegar, soy sauce and some kinds of miso. 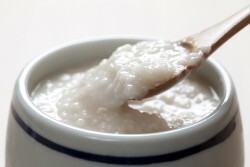 Koji mould is mixed into steamed rice or other starches like potatoes or soy beans and allowed to ferment. 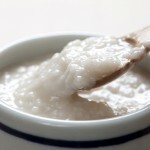 The fermented product is also called Koji, which can be confusing, but essentially, koji is the source of micro-organisms. Fermentation, the process of transforming and preserving food with bacteria or micro-organisms, is responsible for the umami factor in many foods like soy sauce, balsamic vinegar, sauerkraut, cheese. So by using this koji mixed with rice and adding salt as well, we get Shiokoji (shio means salt in Japanese), which looks like a runny rice porrridge, but very salty. Interestingly though, when added to food, it’s not so salty, but makes meat very tender and fish very juicy. You can buy shiokoji in a jar in Japanese grocery stores, but they can be quite expensive. Or you can buy koji in a kind of clay like mass, which you can break up and flavour by adding salt, mirin and hot water and allowing to ferment at room temperature for at least a day. Then in the summer, place in the fridge, in the colder months in a cool place and mix every day for about one week, and your shiokoji is ready to use. We use it on steak, fish, vegetables as an alternative to salt. The explosive boom in Shiokoji began around 2008, 2009, and in recent years, different kinds of koji based foods are beginning to appear in Japan. The Japanese diet, as with many traditional diets, always includes some fermented foods, which are the best thing to keep the microbial ecology in your intestines healthy. Nukazuke, natto and miso are regular as rice for most Japanese. There is increasing scientific evidence that a healthy gut is crucial to longevity and overall health. Sandor Katz, an American fermentation guru’s site Wild Fermentation is a good place to start you on your fermentation journey if interested.